I've been feeding magpies for a while now and the Currawongs, Butcherbird and Crows have now started to appear for the scraps. They're not eating when I go inside, but they're on the outskirts while I feed the magpies, eating anything they can find and looking forlornly at me in the hope that I throw far and wide - which sometimes I do. 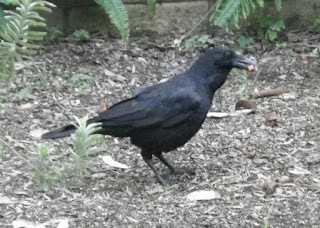 But it made me wonder if this visitor was a raven or a crow. So I had to go and consult my trusty Pizzey (A Field Guide to the Birds of Australia by Graham Pizzey). Pizzey tells me that they have white eyes when adult, so my visitor must be a juvenile. And their eyes are brown for a period of 12-15 months depending on species, then they turn hazel and move to white over time. Cool, huh? I'm not sure how many more Wildlife Wednesdays I'm going to be able to do. I'm running out of local wildlife! But I have a bit of a holiday coming up, so maybe I can stock up on some out-of-town wildlife then. Until I replenish my supplies, I might extend the posts to include flowers...and yes, I'll be as hopeless at identifying them as I am with critters, maybe worse! !